Avoiding the tragedy of overwhelming the space is of utmost importance. Gone are the days when a room is swamped with pattern and little else but the wallpaper is noticeable. So…we’ve been discussing wallpaper for the past few posts. I’m not sure why I picked this topic for such a long series, but just let me say that I’m seeing more and more wallpaper being featured in magazines and I often get questions from my students and clients about how to use wallpaper effectively. The reasons behind new and innovative wallpaper applications are many, but of utmost importance is avoiding the tragedy of overwhelming a space. Gone are the days when a room is swamped with pattern and little else but the wallpaper is noticeable. Sometimes designers limit the amount of paper used to an accent wall, or even apply it to a small piece of furniture in an attempt at keeping things simple. Another reason for limiting the amount of paper used in a room is that the art on many current papers is quite large and could easily clutter-up or overwhelm a small room. Using it like a piece of artwork, instead of enveloping the space in the pattern is much smarter. Affordability is another reason to limit its use. Often these amazing wall treatments are quite costly and sold by the foot or even by the yard, like fabric, as opposed to the single roll method we’ve been employing for years. Using expensive paper on just one accent wall allows for the super chic look of a high-end paper, without breaking the client’s budget. Alternately, you might try using an understated paper in a small room, like in this image from my client’s powder room. 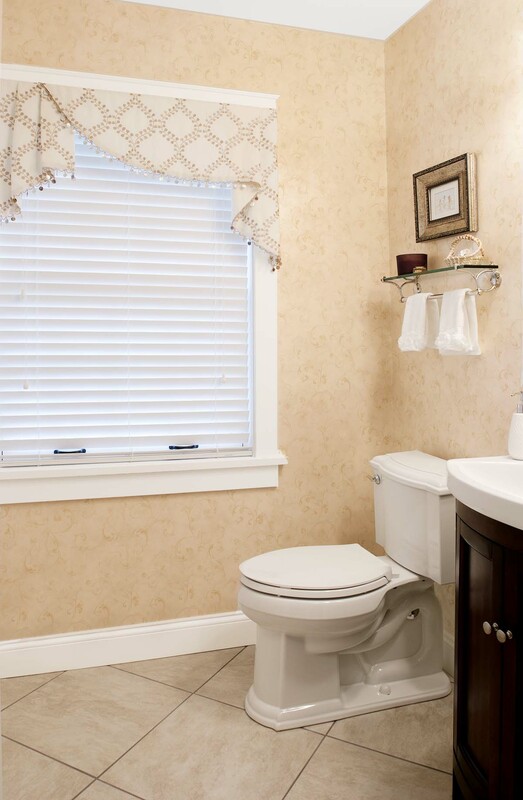 Ivory Wallpaper envelops this tiny powder room. Psychology regularly comes into play when deciding on wallpaper placement. For those with commitment issues, it’s much more likely they’ll use a small dose of paper, thus avoiding the huge mental hurdle required to cover an entire room. It’s most certainly easier for those with painful memories of wallpaper removal in their distant (or not so distant) past. Imagine how much easier and less costly it would be to cover, and eventually remove, just one wall of paper. Check back next time for more on the wallpaper redux! Please tell everyone about my blog: I need all the friends I can get! This entry was posted in Color, Decor, Decorating, Home, Home Decor, Interior Design, Renovation, Wallpaper and tagged accent, accent wall, affordable, application, artwork, budget, Busy, Color, Decor, Decorate, designers, Interior Design, Interiors, overwhelm, pattern, powder room, stairwell, Wallcoverings, Wallpaper, Walls. Bookmark the permalink.